A must have free plug-in for any environment that runs vCenter. 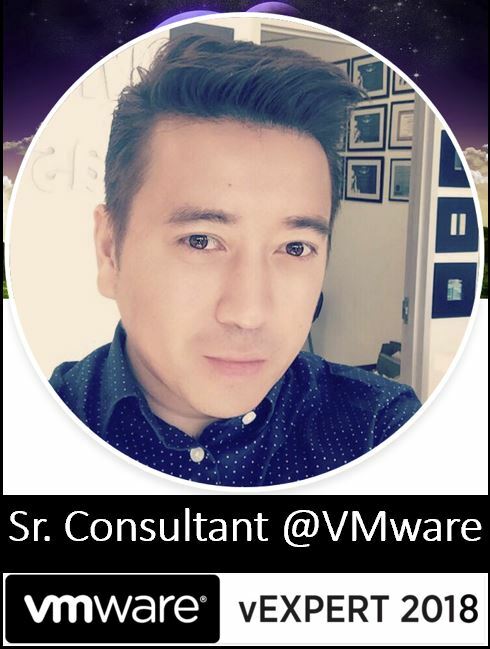 VMware vCenter Support Assistant accelerates Support Request resolution by allowing you to easily create and track support request through vCenter. It also can provide proactive alerts and recommended fixes for technical issues even before the problem occurs. 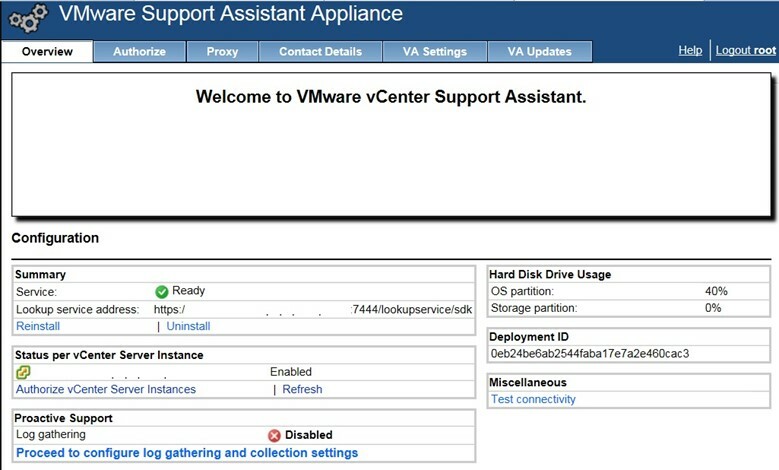 This guide will show you how to configure VMware Support Assistant starting first with listing the benefits of vCenter Support Assistant below. Receive proactive alerts and recommended fixes: Automatic notifications within vCenter keep you up-to-date on any issues and provide you with recommended solutions. Transmit selected log files automatically: Selected log files are collected and regularly transmitted to VMware Tech Support and matched to a dynamic list of known issues sourced from hundreds of thousands of customers. Configure data collection times: vCenter Support Assistant allows you to set the collection frequency and time of day to minimize impact on your system’s performance. File technical Support Requests within vCenter: Use vCenter Support Assistant to file support requests for any product for which you already have VMware (not OEM) support entitlements – regardless of whether that entitlement is via subscription, or paid-for incident packs. 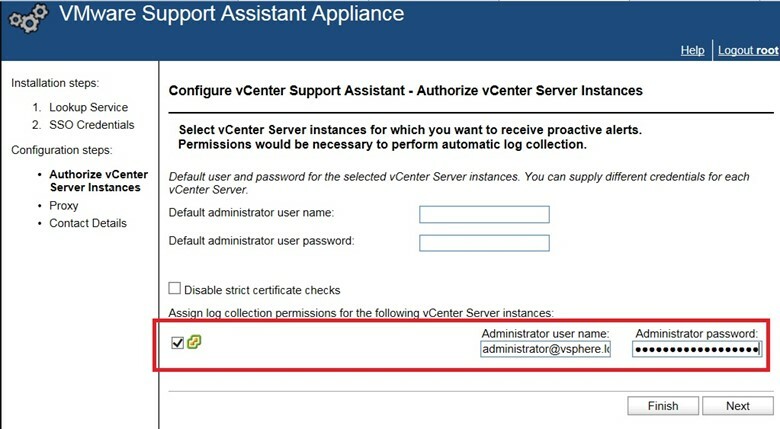 Collect and attach diagnostic information and other files: With just a few clicks, vCenter Support Assistant can directly generate log support bundles from vCenter Server and vSphere. You can also easily attach other files, such as screenshots, to your support request. Files are sent securely over SSL. 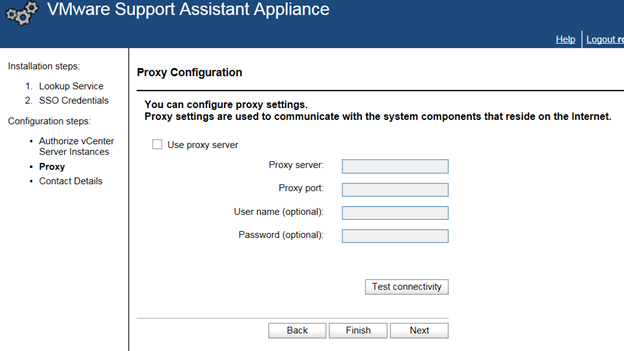 Installing the OVF file is very straight forward, after installing the appliance follow the steps below to configure vCenter Support Assistant. Check the box next to your vCenter you want to monitor and enter in the username and password you want to use for collecting logs. 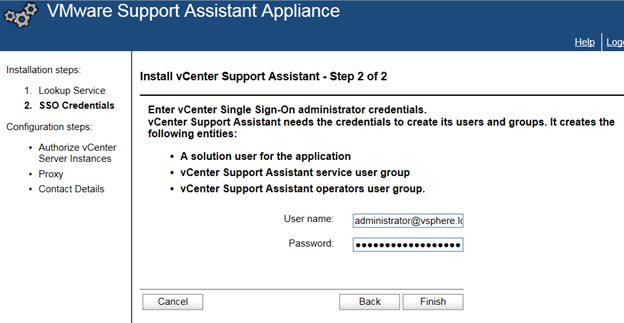 In the Home page you should now see a new vCenter Support Assistant icon. Click on it. If you go back to the Support Assistance portal you will should now see that Proactive Support is now Enabled. Click on Test Connectivity to verify everything is working as well. 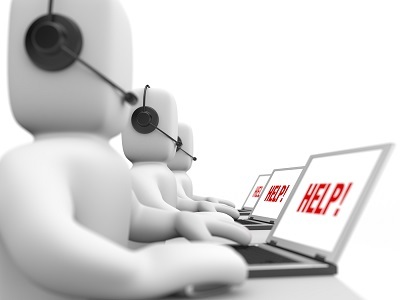 You now have the options to create a new VMware support request without calling it in. Also you can track and modify the open tickets as needed.